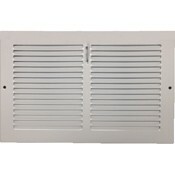 New metal vent covers are an easy and economic way to brighten any room. Have your new baseboard registers shipped straight to your door for unmatched convenience. 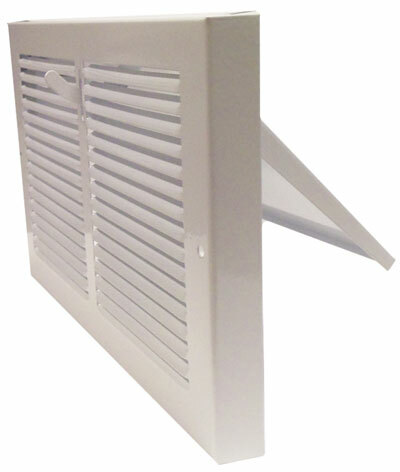 These metal vent covers are offered in six common sizes. Baseboard vents have a 7/8 inch turn back to the wall. You can control the air flow through your metal vent cover using the lever to open or close the plate damper. The baseboard vents have a solid steel core with an white finish. The steel construction of the metal vent cover provides outstanding durability, while the finish provides baseboard vents with long lasting protection from corrosion or rust. Metal vent covers will be shipped with matching installation screws. Tip: Order the metal vent cover that match the size of the hole in the wall. If the wall opening is 10" x 6" you will need 10 x 6 baseboard registers. Outside measurements are approximately 1 1/4 inches larger than the duct hole sizes. Find additional types of baseboard registers in both wood and metal. Replacing baseboard registers is a breeze and you will love the look of these sleek white registers at your baseboard. Order today!